A Right-of-Way is a strip of land dedicated to the use of the public by virtue of legal documentation or long use. Types of Right-of-Ways include but are not limited to: roads, streets, alleys, utility easements, trails, etc. What is an Excavation and why do they happen? An excavation is where a person or company cuts or digs a hole of any type in the ground, or in any way disturbs the existing earth or infrastructure contained within a public right-of-way of the City of Richmond, Indiana. 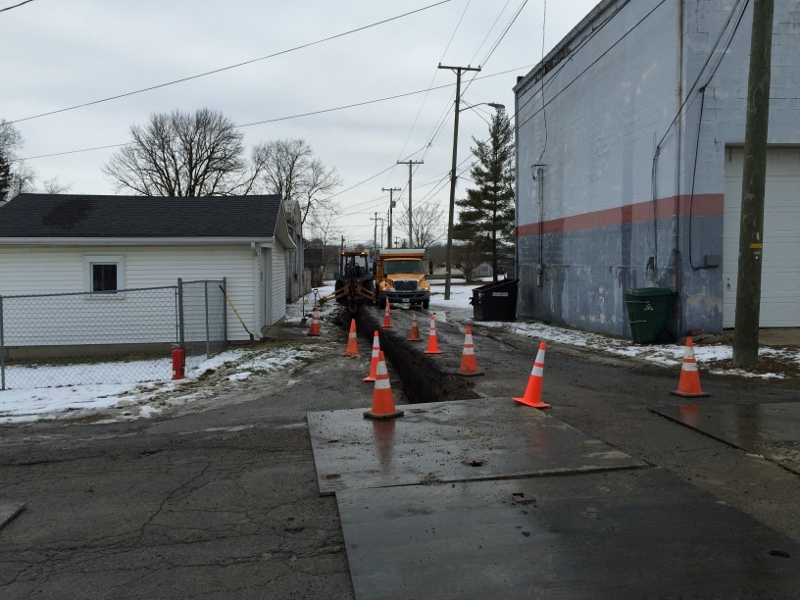 Right-of-Way Excavations are necessary to install or repair many of the utilities that go to our homes and businesses, such as gas, water, or sewer. Per City Code 96.10 a permit is required anytime there is an excavation of any kind. The City passed this code in order to track who, what, when, where, why, and how an excavation is done in a Public Way. By tracking these excavations the City can ensure that the excavations are repaired properly and in a timely fashion. The permitting process also allows for better coordination with utilities so that traffic interruptions are kept to a minimum, so that residents and businesses in the work area are inconvenienced as little as possible. Individuals or Companies needing a permit may come into the Engineering Office located on the 3rd Floor of the City's Municipal Building, located at 50 N. 5th Street, to apply for a permit or they can request an electronic application (instructions below) and submit it by email. Before submitting an application for permit please review the following City Code, Standard Detail drawings, supplemental forms, and information to familiarize yourself with what is required in obtaining a permit and completing your work. 2. Once you submit your contact information you will be sent an email with a link to the permit application form. Fill out the application form and submit. 3. Your application will be reviewed by our office, and once approved you will be notified that the permit can be picked up. You must pay for your Permit and provide all required documentation (i.e. bonds, insurance, plan drawings) prior to it being given to you. A check made out to the City of Richmond, Indiana is preferred. You may pay for and pick up your Permit in our office during normal business hours. If you have questions or problems using our electronic application system, please call (765) 983-7325 for assistance.